August 22, 2017 – LASP has joined forces with universities and space agencies from around the world in an international effort to design and build small satellites as a way to train future scientists and engineers. The project, known as the International Satellite Program in Research and Education (INSPIRE), so far involves the U.S., France, Taiwan, Japan, India, Singapore and Oman according to Project Manager and LASP engineer Amal Chandran. The aim of INSPIRE is to establish a long-term academic program for developing a constellation of small satellites and a global network of ground stations, Chandran explained. INSPIRE partners include the Indian Institute of Space Science and Technology and the Indian Space Research Organization, National Central University and the National Space Organization in Taiwan, the University of Versailles in France, Nanyang Technological University in Singapore, Sultan Qaboos University in Oman and the Kyushu Institute of Technology in Japan. The INSPIRE leadership also is developing a three-year course curriculum on spacecraft design and space systems engineering, as well as a Master of Science degree in space technology, sciences, entrepreneurship, policy and law, Chandran said. 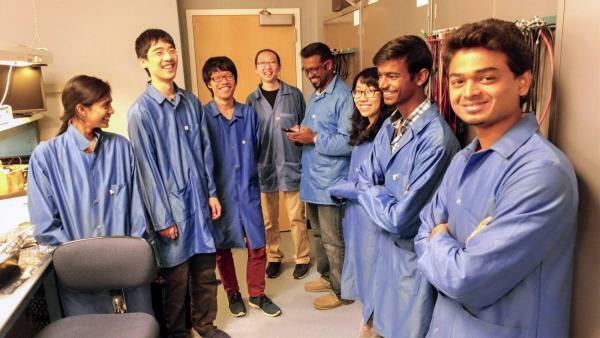 A recent INSPIRE meeting at LASP followed the kickoff meeting held last year in Taiwan, which resulted in a project to design and build a small “CubeSat” satellite to study the ionosphere—an electrically charged region in the upper atmosphere that can influence space weather. The satellite and instrument consist of a series of three connected, cube-shaped objects—each about the size of a Rubik’s Cube and which together weigh about 8 pounds—built jointly by LASP, the Indian Institute of Space Science and Technology and the National Central University in Taiwan. The instrument is slated to launch as a secondary payload on an Indian Space Research Organization launch vehicle in 2019. LASP is building the spacecraft to house the instrument package. The INSPIRE project has received continuing support from LASP Director Daniel Baker and LASP Senior Advisor Mike McGrath, says Chandran. LASP is a research institute at the University of Colorado Boulder and is an internationally known space research facility that has designed and built instruments that have visited every planet in the solar system, controls four NASA satellites from campus, and has designed and built multi-million-dollar instrument suites for a number of NASA missions.